Mobile gaming for the Android user can be slightly more complicated than a download for the iPad or iPhone, as the settings differ. Click onto the settings on your Android device, choose applications, and see whether there is a tick beside unknown sources. If not, put a tick against the box, then you will experience no download issues with the Lady Lucks Android casino app. The Bonus Wagering Conditions – There is a 100% bonus up to £100 available to all new players with an additional 100 extra spins when you register and play casino slots through the Lady Lucks Android casino app. The bonus can be used on a variety of fun mobile games, including bingo, casino, and mobile slots. Significant terms for this offer can be found below. You can register and claim your casino bonus right away. To do this start by selecting the button below. Once you are directed to the next page hit the register button, fill in a few details and your account will be up and running in no time. You can download the app on all of the major mobile and tablet devices, including Android & iOS. The LadyLucks app is not available from the app store. Instead you are required to install the mobile web app for easy access to the Ladylucks online portal. Firstly press on the download button below, then proceed with the easy to follow steps shown in the images below. LadyLucks appear to have simplification and specialisation in mind with their service. Previously there were bingo services also being offered alongside the casino side of things. However the LadyLucks bingo app has vanished, leaving the focus on providing a high end online casino experience. Game-wise, there are not as many titles available as other popular online bookmakers, but there is enough games choice to satisfy the appetite of any eager online player who wants to play for real cash prizes. What’s more, each of the 31 Lady Lucks games is designed in house. You won’t find them available to play through any other online gaming merchant. Many £1 bets on slot games deduct £0.50 off the play through. All other games reduce the play through by £1. What is important to note with Lady Lucks is that any real monies will always be used before bonus funds. In order to withdraw any winning prize funds, you must make a cash deposit. The Lady Lucks Android casino app has easy navigation. Browse the multitude games, all of which are exclusive only to LadyLucks. The Touch Casino Games have a (T) beside them. These are suitable for Android apps. The feature phone games have an (F) beside them, while (HD) are high definition games. When you become a regular player of Lady Lucks, you can access the regular cash back promotions. If you’re eligible for the offer you will receive a text message. The cash back will be credited to your account within 72-hours. 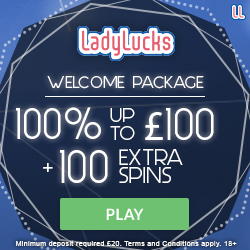 Sign up to Lady Lucks and play exclusively through the Lady Lucks Android casino app. The LadyLucks casino app has a patriotic feel to it courtesy of its red, white and blue colour scheme. Graphics aren’t gimmicky and the clarity of information and easy shortcuts lend themselves to easy navigation of the site. As well as the opening offers, the LadyLucks bingo app has a further plethora of promotions for its members to enjoy. These include the Daily Bonus Bonanza in which you can win a range of prizes simply for logging into your account. Prizes include cash awards, deposit matches, cash-back offers, bonuses and free spins. Also watch out for monthly promotions which have recently included the chance to win £500 high-street gift cards for shops such as M&S, iTunes, Amazon, TopShop, Curry’s and John Lewis. There are a number of game providers now on board that host their title creations on the LadyLuck casino app. Therefore, there is a nice mix of graphics and game-play experience. Unlike some that simply place a different skin over the same game to make it look slightly different. These games are additional to the exclusive games hosted on the LadyLucks casino app. Besides the generous deposit bonuses available when you join Lady Lucks, you can also earn bonus credit through the refer a friend scheme. For every friend, you refer your account will be credited with £20. There is no limit to the number of family and friends you can refer to Lady Lucks. However, the family or friend must have made the first deposit before you get access to the £20 credit. It’s more gaming fun to experience through the Lady Lucks Android casino app. The bonus wagering conditions are high though at 50x the bonus funds before withdrawals are allowed. There is no loyalty package as such currently available at LadyLucks. However regularly getting involved with the promotions can bring a lot of value to your day-to-day gaming. There has been more advanced loyalty features in the past. However, this feature appears to have fallen victim to the simplification strategy. Whether anything in this aspect is on the horizon, we just aren’t sure. If the app begins to flourish in terms of active users – there’s a good chance it will is my view. LadyLucks are keen to continue to grow their Facebook fan-base and there are loads of exclusive prize giveaways (gifts such as cash, iPhones & games consoles) and all you have to do to be in with a chance of winning is join the community. Facebook members will also receive notification of big winners and get sneak previews of new games.